How can I tell if I have USB 2.0? - Ask Leo! I’m thinking of purchasing a USB device, but it requires USB 2.0. I can’t find anywhere on my machine that tells me whether or not I have this. How can I tell if I have USB 2.0? USB (for Universal Serial Bus) 2.0 is a significantly faster version of USB 1.1. Some devices can be quite speed intensive, and hence manufacturers are starting to require the faster connection. Most new machines come with USB 2.0 already built in. But what about an older machine? How do you tell? It’s easy, just not at all obvious. Note the highlighted line: “Standard Enhanced PCI to USB Host Controller”. While the exact text may vary, the key is the word “Enhanced”. If it’s “Enhanced”, it’s USB 2.0. If it’s not, then it’s USB 1.x. Important: on most machines the presence of “Enhanced”, even only once (which it typically is), means that all USB ports are USB 2.0 ports. Typically a machine will have only one type of port and this tells you which kind they all are. The one exception to this scenario is a machine with USB 1.1 ports that has a USB 2.0 expansion card added. In this case I know of no way to tell which is which, other than simply knowing you added a USB 2.0 card to a machine with built-in 1.1 ports. Obviously in a case like this, the built-in ports are 1.1, and the added expansion card ports are 2.0. What’s the Easiest Way to Upgrade an Older Machine? - Upgrading a computer can be a lot of work, is going to cost some money, and depends on your needs. I'll show you where to start. « Previous post: How do I find out who owns a Hotmail account? If an “Enhanced PCI to USB Host Controller” is present does that mean that ALL USB connections on the PC and shown under Device Manager are USB 2.0? Some of the older computers have both 1.1 and 2.0 USB ports. It means that the USB on your PC supports 2.0. You can still, of course, plug in 1.x USB hubs which would only support 1.x, and 1.x devices. I think Simon is asking the same question I was going to ask. If you have say 4 USB ports in your computer, and you have the “Enhanced PCI to USB Host Controller” showing in your Device Manager, does that mean that ALL 4 USB ports support 2.0? Or is it maybe only one of them? How can you tell which port does? Other than that clarification, thanks for this article! First google hit off the bat answers my question. Cheers. While it’s certainly *possible* for a computer to have different types of USB ports, I don’t know of any that do. Typically when the manifacturer makes the switch to 2.0, there’s no reason for there to also be a 1.x USB port. So I would assume that all USB ports on the computer are the same. Now, if I don’t have USB 2.0, is there a way to upgrade to that? (I, too, want to buy an Ipod Nano that is only supported by USB 2.0). For a desktop PC. sure. You can buy a USB 2.0 add-in card – they’re not expensive. Not as sure about laptops – I believe there are USB 2.0 pcmcia cards available. I have purchased the Belkin Hi Speed USB 2.0 DVD creator and can’t make it work. It only shows b/w, stripes and ‘jumping’ frames. Doesn’t matter what software I use. I’m thinking that it hasn’t been plugged into a USB 2.0 port. However, whilst my Device manager states that I do have an Enhanced USB port, I haven’t been able to make it work despite trying all USB ports on my workstation, on my laptop and on a Dell slim line computer on our network. Is it likely that I don’t have a USB 2.0 port after all on any computer. We build my workstation ourselves, the Dell is 3 years old and the laptop is a Dell Inspiron I bought late 2004. OK, so my question is this: Only one of the listed controllers says “enhanced”, does that mean that only one of my usb ports is 2.0 and if so how can i find out which one. A related question; I actually have 4 USB ports on my computer, why are only 3 showing up, or do these listings not corelate directly to each individual USB port? I don’t believe it’s a one to one mapping. It’s more a reflection of how the drivers are structured to provide support for both 2.0 and 1.0, and other things that I can’t begin to guess at. As I said in the article, if it lists enhanced, and all of your ports are built in to the machine, I believe that they are all 2.0. I found your article very informative. It jogged the memory cells in my head. I do have one question about the USB ports. What announces to the Device manager that you have USB 2.0? Is this stored in the BIOS or in WINXP itself? The reason I ask is that with all the updated drivers, I have a Logitech Fusion camera and a MAXTOR One touch external USB hard drive that will not work on my PC. However, they will work on my wife’s 2 computers that has just about the same motherboard. MSI NEO2-F (mine), MSI NEO4 (hers). Any thoughts? Thanks in advance. It varies, I believe. Some BIOS’s have supprot for USB, but what’s more common right now is that it’s windows that detects the hardware (via Plug’n’play) and loads the appropriate drivers. If other USB devices work on that computer, and only the external hard disk fails, I’d look to the manufacturer see if it needs some kind of additional support. I read your helpful article to check USB ports version and I confirmed that I dont’t have the magic “Enhanced” word. So I have USB version 1.x..;(. My question is: can I use a USB 2.0 device in a USB port version 1.x? Is just a question of speed or I should worry about compatible problems? It really depends on the device, some will, some won’t. This is exactly my problem. Have you been able to find a resolution for this problem? Have you tried plugging it into the other USB ports? That’s what I would try. I recently bought an used lap top computer from a person known to me. its NEC – Versa – Aptitude – PIII. since it has only 30 GB HDD, i bought a 60 GB 2.5external HDD with USB casing. but when i connected it to Laptop, it gives a message that i am connecting high-speed device into a non high-speed port!. the laptop has Intel(R) 82371AB/EB PCI to USB Universal Host Controller. Tell me what are the options available to me to use the full speed capabilities of the external HDD? can i use the pc card slot with a convertor to USB2.0 or the firewire port to convert it into USB2.0?? please tell me in detail as i am not a IT tech! Firewire is different and won’t help (unless the drive you’re talking about also has a firewire connection). In either case I would simply get a USB 2.0 adapter to add to your machine. Since you have a laptop, you should be able to find a PCMCIA adapter that supports USB 2.0. It doesnt say “enhanced” so, I’d say you don’t have 2.0. Assuming that I have an old USB 1.1 port on my Dell Latitude C600, can I multiply it by buying a USB 2.0 4-port hub made by Belkin, Dynex, etc. ?? I know combinations of 2.0 and 1.1 always downgrade to 1.1. Does the 2.0 have to be upstream of the 1.1? My 1.1 would be upstream of the 2.0. No, you’re limited by the interface on your laptop. Will a USB 2.0 Thumb drive work in a USB 1.1 socket? Will a USB 1.1 Thumb Drive work in a USB 2.0 socket? a) Maybe/probably (it depends on the USB 2.0 device). It’ll be slower, though. b) Yes. 1.1 devices should work in 2.0 ports. This is helpful but how can I tell which of my physical connections this applies to? There are a lot (8) USB connections on the PC but only one of them is listed as ENHANCED in my dev. mngr. How can I locate it on the PC? “Enhanced” is typically a system-wide attribute. If these are the ports your PC came with, it should apply to all the ports in your PC. I have 2 USB ports on the front of my computer and 4 on the back. My device manager states that the host controller is USB 2.0…but is it possible that the front 2 are USB 1.1, but the back 4 are 2.0? Help – Just built computer with ASUS 939 MB, running XP with SP2 and updates. Installed MB disc from ASUS with drivers, but have no USB. Device Manager shows “standard enhanced PCI to USB host controller” as not installed. ASUS disc says that drivers not needed for USB 2.0, as they are in XP. I’m frustrated trying to find out what the problem really is. Ahgo, the typical troubleshooting is to delete in the device manager whatever is having trouble. That is, if it has a red x or a yellow !. Then the next time you restart, it will detect it and take you through reinstalling it. And this time around you can focus on that one driver. A second option is to right click & choose properties on the ! or x, then choose update driver. Your ASUS disc is correct, XP has standard drivers for USB. Sounds like the docking station has additional USB ports on it which are 2.0 compatible. My PC has a label on the front USB ports saying USB2. How can I tell if the 4 ports at the back are ALSO USB2 or just plain old simple USB1? The “ehanced” thing is there, but does that cover ALL ports or just certain ones? which would indicate it’s plugged into a USB 1 port. Thanks. I just bought two 1G flash drives and discovered it takes 15 minutes to write 962 MB into them (467 jpg pictures). I got the same results on two new computers. I doubted I had USB 2.0 so I verified I have USB 2.0 per your article. Is this normal speed for a new “fast” 1 G flash drive ? Not what I expected. flash memory write speed is the bottleneck. Yep. Enhanced means enhanced and that means 2.0. I have 6 USB ports on my computer. 2 in front and 4 in the back. I went to the Universal Serial Bus controllers and see that I do have an Enhanced USB controller. How can I tell which one is the enhanced port? I am running windows vista ultimate 32 bit. that ALL the ports are USB 2.0. I have 8 usb hubs on my compa and one of them is 2.0, how do i figure out which one it is? I am running Win 98SE on a PC thats approx 4-5 yrs old. I have 4 built in USB ports, 2 in front 2 in back. I want to get an external HD but they all say 2.0 USB, i do NOT see ‘enhanced’ on my device manager. can i purchace a USB port and insatall it on this machine for the external HD?? Yes, there are expansion cards that will add USB 2.0 ports to an older system. In fact I’ve done exactly that on one of my older systems. Computer has one USB 2.0 controller and three (or five, if you enable all the ports) USB companion controllers that report themselves as USB 1.1 devices. If you plug a USB 2.0 device into any port, the device functions at USB 2.0 speeds; the controller handles the logic internally. USB controllers from different vendors might not report ports in the same way and might not indicate that all the ports are USB 2.0 capable, but each should have the same functionality. If all the USB ports are 2.0, according to your comment above,if just one of them says “enhanced” then why do I keep getting the message that my device could work faster on a hi-speed port? Are you saying that all 6 usb ports on my computer are hi-speed even though only one says enhanced? If you are not saying this, how can I tell which one is the hi-speed one? Possible solution to get rid of message… Click on properties of the “enhanced” USB in device manager. Then click on “Advanced” tab… at the bottom will be an option to ignore usb errors… choose that and hit ok. That should get rid of the message. Hope that helps. In the example regarding identifying whether or not one has USB 2.0, the picture also shows four listings for universal host controllers. Does this mean that some (four) of the USB ports are 1.1 and one is 2.0? Regarding the previous message, does the word “Enhanced” mean all the computer’s USB ports are 2.0? If not, how do you identify which port on the PC is 2.0 and which is 1.1? machines that means that ALL USB ports are 2.0 ports. Locate your device in the tree, paying attention as to whether it’s under an “Enhanced” controller or Standard. I believe there are instances in which new computers have both; the 2.0 are on the main part of the PC, but the additional ones — on keyboards, monitors — are 1.1. I think this is true of Apples, too; the back of the monitor is fine but anything on the front (ie, keyboard) is not. Thank you Leo for the info. I have a machine my buddy built for me and I see in the Device Manager that there are no ports that say “Enhanced PCI to USB Controller” but I do have an additional Serial Bus Controller that says “USB 2.0 Root Hub Device” but I cannot locate the actual physical port. Is there any way to find out without doing the plug and pray method? I have a computer with 8 physical USB ports. In the device manager I can see 4 standard host controllers and 2 enhanced host controllers, but neither of the two enhanced ones are connected to one of the 8 physical USB ports. They are all internal. So, even if you have an enhanced host controller, it does not mean you have a USB 2.0 port on your computer. It just means your computer is capable of having a USB 2.0 port, unfortunately. And regarding the driver, it has to be 5.1.2600 or later. Everytime I insert a USB device it tell me “this device can perform faster” I checked to see if I am USB 2.0 enabled. The thing is that I appear to have two USB contollers when I checked the Device Manager. Shouldn’t I only have one. I have 3 usb ports on my laptop. Came across your site when trying to solve a usb problem with an old server. If it is of intrest, it does indeed have two different speeds, 1.0 at the front and 2.0 at the back. Not common though! I made no special requests to Dell regarding the configuration of the workstation and in fact there was no discussion of the USB ports at all, it’s just a standard workstation–though I did order extra RAM and HDD space and a faster CPU. So I believe even considering the qualifier, “… on most machines…”, it is still incorrect. Note also another poster’s observation (Adrian at August 27, 2008 8:18 AM) which seems to mirror mine. I would like to hear from the site host Leo here by way of a post if he thinks this is the case, but it seems he does not follow up. In sum, the information from Leo Notenboom regarding discrimination between USB 2.0 and 1.1 seems not particularly well-researched or thought out. This is just an added information regarding the said issue. I have a 2 usb flash memory when I will insert the flash memory it will prompt me “this device can perform faster” but when I connect also the other (flash memory) on the same port it will not prompt “this device can perform faster” Maybe one of the cause of this issue is the usb flash memory that you are inserting. No – USB 2.0 is different hardware. You could purchase an expansion card that has USB connectors; that’s what I did on one of my older machines. when i plug usb device into my pc always appear update driver wizard why? I wish people wouldn’t write articles when they are clueless. I have a machine that DOES NOT have an add-in card and yet has USB 1.1 and USB 2 ports and yes it does state enhanced. So you are wrong and it really annoys me when people make assumptions without checking their facts and then pass on inaccurate information to someone else who relies upon it as being correct. I have a Dell Latitude D620 laptop with both USB 1.1 and 2.0. The USB 2.0 is used internally for the bluetooth and the card reader, as well as two of the four external ports. The other 2 are 1.1. So I’d imagine the rarity of having mixes is less than the article indicates. Recommend you update your article as it would seem the standard has shifted. Still, thanks for initiating the discussion, I would not have been able to figure out my system as fast as I did without the article and comments. I did everything you described. Nothing has changed. The computer is virus free, and all drivers are up to date. So why are my USB 2.0 devices still running so slow? I had to do a reformat, and since then, nothing has worked quite right except for very fast boot-up time. I have driver detective, downloaded the drivers I need, but still this is a bummer. I’m running windows xp service pack 2 home edition by the way. If you can help me out with my peripheral hard drives and such, that would be great. I have a computer with the AMD 1700+ motherboard. OS is Windows XP S.P2. My 2 USB drivers at the rear of the computer are too slow to read contents of a pendrive etc. A little off topic but I was wondering if there is a difference between the front and rear usb ports? I’ve checked like you describe it and have enhanced so USB2.0. But when I apply an WiFi antenna (capable of 300Mbps) on the USB port and do a file transfer the rate is 12Mbps equal to the max of USB1.1. The question is NOT if I have 2.0. It tells me that ad nauseum. GREAT! I have 2.0. The real question. The hard question is which ports are 2.0?!?!?!! How do you find them? Just plugging something into each port doesn’t do it. And that alone is a lot of work. The computer is under a desk with lots of cables so it doesn’t move easily. When you plug something in that might benefit from 2.0 and wait for the message “This could run faster yada yada yada….” If it doesn’t show is that proof? I am not sure. So what is the fastest easiest way to tell which ports are USB 2.0? On most computers, and certainly most all newer computers, all ports are the same – if it shows “enhanced” then on most computers all ports are 2.0. How do I test whether my USB thumbdrive is USB 2.0? I have followed your instructions to find out if I have USB 2 on my 18month old computer running Vista. One of the entries is VIA USB Enhanced Controller. Does this mean I have USB2? The answer is in the article you just commented on. Since yesterday I’m getting messages after plugging in my external HD all the time saying my HD can perform faster if plugging it to a faster usb2. But my ports are USB2 and they always worked fine.. Now for some reason it does seem to work slower, 1 hour ago my computer didn’t even recognize my HD no more.. Now it does again, but still that message.. My boyfriend said he’s getting the same message when plugging my HD into his laptop since yesterday.. What’s going on?? Depends on your internet connection. USB 1.1 is 12 megabits per second. If your internet connection is faster than that, you’ll want USB 2.0 (480 Mbits/sec). I installed a 2.0 USB card in Pci. I plugged in 3 HiSpeed items , nothing happen, camera card, camera and mouse. Device Manager shows Enhanced… “” What will show up on my screen when I plug something in the 2.0 USB , does it show same as the 1.1 USB? If I have a Motherboard that is completely USB 2.0 Equipped (no old style ports) but some are wired to myfront panel, doesn’t the wiring slow the USB down? If so are they truly 2.0? The wiring shouldn’t impact it. My copmuter doesn’t show any host controller. Is there something wrong? Perhaps. Or perhaps you simply have no USB. Thanks Leo for not just saying “this is how you tell if you have USB 2.0, but as an aside, if it appears once, they should all be 2.0.” It was so easy to explain that but a few other sites I visited first never mentioned it. Thanks for explaining this clearly, straight-forward, and thoroughly. I appreciate it! Your site has been bookmarked! Hi, I have purchased the BioSTAR G31D-M7 board, in the specifications it clearly states that it has 4xUsb 2.0 ports. However I am not able to see the Enhanced thing you mentioned in the Pic and my USB is also only running at 1.1 speed. Is there anything I could do to get the USB working to 2.0 speed ? Make sure you have the proper drivers for that board. In response to the above question and to Ajay Varma’s comment/question. There is something else people need to remember that is easily forgotten. Not only do you need to be aware of what devices and ports are USB 1.1 and 2.0, but you also need to be aware whether you are using a USB 1.1 or 2.0 cable. Of course our wonderful non-user-friendly computer manufacturers decided to manufactured both 2.0 and 1.1 USB cables to look very similar to each other, so there is generally no easy way to tell what speed your cable is spec’ed out as by just looking at the cable. I am sure Leo has a few threads that cover this computer challenge. Back to my point, you may have a USB 2.0 port and a 2.0 device, but unless you have a USB 2.0 cable, you are not going to get 2.0 speeds and you will get the message telling you “hey dummy, you know I can go faster don’t you?”. You need all three pieces of the puzzle to be USB 2.0 to make everything woork nice together with at the high speed that 2.0 offers. It’s just another complicated day in the computer world. I posted a comment earlier that I have since discovered is mostly not correct. Most, but not all 1.1 USB cables will work and transfer data at 2.0 USB speeds when used with 2.0 devices and ports. I apologize for the mis-information. I of course did further research using Leo’s great website to expand my knowledge on USB technology to discover my error. Thanks Leo! Thank you for your aticle explaining how to check for USB 2.0! Now can you answer the burning question: how to check if I have USB 3.0, especially on Mac OSX (Snow Leopard) ? I am always leery of places explaining “how to”, as I’ve no manner by which to verify. That you admit to, and correct a previous answer demands respect from me. I have one instance of the enhanced controller, followed by 3 instances of universal host controller, then this is followed by usb composite; mass storage; 4 instances of root hub. By your previous statement, I then assume the enhanced covers everything. Yet, when I plug in one device,a message appears suggesting the device could work faster if plugged into an enhanced port, and offers 6 empty unused ports to use. My computer only has 5 ports total, and all are in use. Where would the other 6 be? I hope I have been clear, and can provide more info if needed. I have faith in anyone who can admit a mistake, and set it right. Do it myself rather frequently. As long as you’ve exhausted all the accessible ports you might be out of luck. 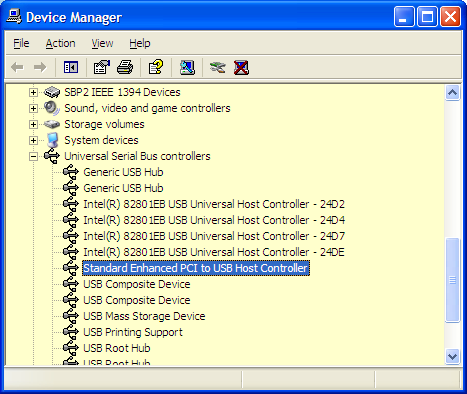 The additional ports that show up in device manager are often internal USB ports (perhaps used for devices internall), capabilities of the chipset that have not been utlized on your motherboard, or perhaps USB ports that are available on your motherboard but have not been connected to actual USB connectors for access. So what if I do have the enhanced controller, my computer has 2.0 printed on it (no add-on usb ports), but my speeds are really really slow to my flash drives. I tested 2 flash drives and it said about 0.6 MB/s read and write. The same drives on another computer tested between 30 and 6 MB/s depending on block size and read or write. I agree with john. I have an older computer, but it says “enhanced” controller. I just bought a blazing fast 3.0 flash drive from kingston, and I got…..22 mbps write rates tranfering 80 G of data to it! A snail’s pace! my computer (5yrs old) has the usb 2 drive but when i put another one in, it wont recognize the 2nd one to transfer files from one to the other. what’s happening? I have a USB 2.0 memory stick, and sometimes I get a message something like “This device can operate better…” indicating that i’ve plugged it into a 1.1 port. I thought I might be able to use this to ‘find out’ which ports are which, but I typically only get the message once – regardless of where I plug the stick in (i.e., removing the stick and putting it into a different port or even the same port doesn’t show the message again). Is there a way to always get the message? or a way to reliably know which is which? Or should I just plum for a 3.0 expansion card (if I can find one) so I ‘know’ where my best speeds are? Here’s an elapsed time program to measure speed of a process. It may show a slower speed with a USB 1.0 port. Type or copy a large text file, maybe 2 or 3 MB, on your flash drive to a differently named text file on your flash drive and note the elapsed time. Do it at least twice since time will vary somewhat. I got the nearly the same time on 3 computers but they were all USB 2.0 ports. I didn’t have a USB 1.0 computer to see the time difference, but the front an back ports on my 3 all had the same times, even using a USB hub extention cable. Control PanelDevice Manager showed only one line as being Enhanced. How to tell if I have usb 2.0 in linux mint 11?? Is that the same as usb 2.0? It says “enhanced” and that’s what the article states you’re looking for. That is the same as USB 2.0. I have a 2.0 device that I see under Universal Host Controller. I think it could perform faster, it is 2.0! How can I force it to be assigned to the Enhanced Controller? I don’t have USB 2.0, but I want to add it. If you’re certain that you don’t have it (most relatively recent computers do) then you’ll need to get an add-in card for your PC. what add on card to add to get USB 2.0? please specify and how much would it cost? Use Google to search for one. What you need depends on your computer. What price depends on where you buy and where you live. Great advice, easy to understand, to-the-point and brief. Thanks! Don’t remove anything. In general if you have even one “enhanced” that typically means all your USB ports are 2.0. I think the easiest way to tell what your USB ports are is too look at the website of computer’s manufacturer, and find a diagram of your computer. Or maybe you still have the info that came when you bought it. Then just remember which one is which! Thanks. I’m on my way to adding a pci usb 2.0 expansion card, did a little research and ended on your blog. Great article. Leo! I have a question! My pc has USB 2.0. I double checked in Device Managers. THEN WHY am I getting pop ups telling me that I’m using a “Generic USB” and need to unplug…and plug into my USB 2.0 Port??? You say if one port is 2.0 then all ports on the pc are 2.0. So this pop up msg. makes no sense…if what your saying is true. Correct? I bookmarked this quite some time ago because I was dealing with computers during that transition time between USB 1.1 and USB 2.0. Now that we have USB 3.0 out there, perhaps you should update the article to include that information. Here’s a start: The plastic piece within a USB 2.0 socket is white, whereas the plastic piece within a USB 3.0 socket is blue. At least, that’s what the standard says. My current PC has eight USB ports and six USB Host Controllers. Four are standard USB and two are enhanced USB2. When a USB 1.x device connects to any one of eight ports the USB 1.x device is controlled by one of the USB standard controllers . When a USB 2.0 device connects to any one of the eight Ports the USB 2.0 device is controlled by one of the USB2 enhanced controllers. However when a USB 2.0 device is connected to a PC with an enhanced USB2 controller, this does not necessarily mean it’s running at full capacity.. The Host controllers drivers for your PC may need to be outdated causing a USB 2.0 device to run much slower. This is also true when running USB 3.0 devices from a USB 3.0 eXtensible controller, the host controller’s drivers may need to be updated to run a USB device at it’s full capacity. mine says both enhanced and standard.. what do this mean? take a look at screen shot.. It means your system is capable of both USB 1.1 and 2.0. I have 8 usb ports, and according to you they must be 2.0, however my Optus internet connection wont work in any of them. it says it need a high speed 2.0 port, and to check witch is. but when I check it says the hub is, and then the hub list every port on the desk top. and so? what do you thin is it an software thing or is it? well what is it? It could be anything from a bad usb controller to bad cables to a bad device to your computer not actually having 2.0 on every port. (I said that MOST computers have 2.0 on every port if “enhanced” is present – that’s not the same as EVERY computer). Check with your computer’s manufacturer. I am happy to know that you have still been responding to questions about USB ports and devices. Keep up the good work. I was thinking, maybe to answer some questions about whether one’s computer has USB 2.0 ports or not, they could find out whether their computer was manufactured in 2001 or later, because USB 2.0 was released in April 2000 based on an article about USB on Wikipedia. It said, “USB 2.0 was released in April 2000, adding a higher maximum signaling rate of 480 Mbit/s called High Speed, in addition to the USB 1.x Full Speed signaling rate of 12 Mbit/s.” USB 1.0 was released in 1996 and 1.1 in 1998. So, again, maybe this may help. So, it’s down to business. I must say though that, I have been trying to figure out my problem on my own for over 2 years, and it was just today that I found you and last week or the week before that I spent money to receive international help, but to no avail. So, for me to go this extent means that I cannot figure out the problem, as I always do. So now, I installed Windows 7 Ultimate (date version 2006) from 2010 to 2012, formatting my hard drive that had Windows Vista Basic (the original OS) installed. Then, in 2013 I formatted my hard drive again and installed a fresh copy of Windows 8. While using W8, I purchased a Microsoft LifeCam Studio webcam that worked at its best, 1080 HD. If I recall correctly, I also used an External Hard Drive that worked at its best too, with a data transfer rate of over 30MB/s. But, somewhere along the way these devices stopped operating at 2.0 levels and forced me to disable the Enhanced controller. Only when I disable it do these devices work. But, instead of 1080 HD camera quality, it’s down to 160×120 and data is now transferring at no more than 1 MB/s with the external hard drive. Again, these problems occurred while using W8. So, I decided to reinstall W7, not only in an attempt to fix the USB problem, but for other reasons too. I reinstalled a fresh copy of Windows 7 Ultimate, the same one I had before. As soon as the desktop loaded after the reinstallation, I plugged in my external hard drive and other USB 2.0 flash drives, but still got “Unknown Device”. Also, whenever enhanced controller is disabled and the devices are recognised, a notification message would popup saying that the devices are able to operate faster if plugged into a high-speed port. You can use AIDA64 to tell which USB port is which using trial/error method by simply plugging any device to a random USB port and checking if it’s in Enhanced USB port. If not try a different port. I have found out all my USB ports are 1.1 with the exception of front panel, these are 2.0. Sounds like an older (and somewhat unusual) computer. My printer wont work and when I trouble shoot – this is what it says. I cant see a USB 2.0 or ‘enhanced’ anywhere? Does that mean maybe that the printer is not compatible with a Windows 10 computer? where is the usb outlet located? None of my usb ports say exhanced. I have one that say extensible. The ports don’t seem to be working. USB 2.0 came out 17 years ago, so if your computer is newer than 14 years old, you almost surely have USB 2.0 or better. My device wnts usb 2.0 and I have 3.0 How do I make it work? Plug it in. A USB 2 device will work on a USB 3 computer. Device has one enhanced and rest not a mention of, has 4 ports, only one in use maybe that it, to lazy to check for now, aside further from that,mucho thanks for the info of course. My Device Manager report differs from the example in Leo’s article. Is this the situation Leo mentioned in the article where *one* port has an expansion card (the last one listed above)? Maybe its time to upgrade my 6+ year old PC. This is a very old article and situation, but as the article says, even if you have only one “enhanced” listed, then chances are that ALL ports are 2.0 (or perhaps better). I can only say “chances are” because it depends on the computer itself. I borrowed a USB 3.0 drive from a *trusted* friend. It works in multiple ports. At this point that is all I really wanted to know; that a USB 3 drive would function on this old machine. What confused me is that my Device Manager listed a port number on the same line that says enhanced. USB 3 devices are made to be backwards compatible with USB 2 ports and vice versa.